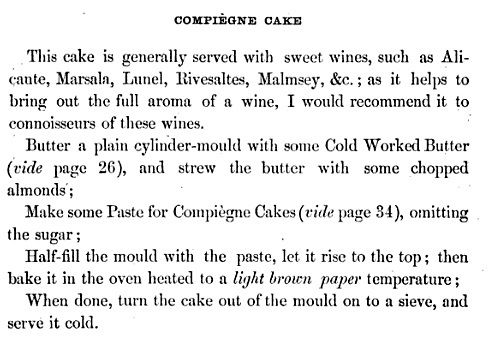 Compiègne Cake was created by Antonin Carême, in honour of the marriage of Napoleon and Marie-Louise of Austria in 1810. It wedding took place in the city of Compiègne, hence the name given to the cake. At her dinner, Queen Victoria served small sized versions of this cake, what we today would call cupcakes. I found a recipe from the era, which gives the base recipe for the dough, and then offered several variations, adding different candied fruits, etc. to the dough and as decoration. The recipe below uses fresh pineapple and candied fruit (though maraschino cherries would work just as well). This cake will serve 8-10 people. I hope you enjoy! * Click here to see the list of kosher alcohols. Remove the butter from the refrigerator at least 2 hours before starting the cake. Cut into cubes and leave it at room temperature. In a bowl (or food processor), combine the flour, sugar and yeast. Add the eggs, yolks and cream. Mix slowly until you have formed a smooth dough. Add the softened butter and mix being careful not to overmix the dough. It will be quite liquid and elastic. Pour the batter into a Bundt pan or Kouglof mould if you have one, and let rise 1 hour in a warm place, such as next to the oven while it is roasting the pineapple. The dough will rise over this time. To prepare the garnish, heat the oven to 350 degrees, and slice the pineapple into thin rounds, and then cut them in half to make a half moon shape. Lay the slices on a baking sheet lined with parchment paper, and scatter the brown sugar on top. Roast the pineapple until it’s cooked through and slightly dried and caramelized. After the hour of rising, bake the cake in the 350 degree oven for 35 minutes, or until when you knock on the cake it sounds slightly hollow. Meanwhile, to make the syrup, mix the sugar and water together in a saucepan, and bring it to a boil. Remove it from the heat and add the juices of the orange and lemon, the coffee and the rum. Mix to combine. Remove the cake from the oven and let it completely cool before unmoulding. This cake will be served crown shape up, so you may have to trim the base of the cake so that it will remain level on your serving platter. Warm the syrup slightly and pour it over the cake. You might find it easier to pour a little syrup back in the cake pan, then put the cake back in the pan, and gently pour the remaining syrup over the cake. Let stand a few minutes to absorb the syrup, and then remove the cake from the pan again, and let it sit on a cooling rack to drain any excess syrup. 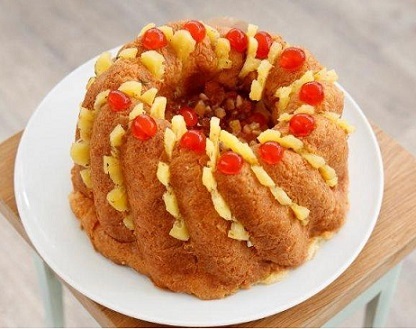 Place the cake on serving plate and make shallow slices around the cake in order to insert the roasted pineapple. Decorate with candied fruit alternating around the cake and piled up in the centre hole. Note: To make this cake pareve or non-dairy, replace the butter with margarine and the cream with non-dairy creamer. This dish, again seems to be a bit labour intensive, but again, worth it! The best advice I have for you is to make it at least a day in advance, if not two, so that the flavours have a chance to meld and develop. If not, you might find it somewhat bland and unbalanced. I also recommend serving it chilled. In a medium saucepan, whisk together egg yolks and sugar until well blended. Whisk in milk and cook over medium heat, stirring constantly, don’t stop, until mixture boils. Boil gently for 1 minute, remove from heat and allow it to cool slightly. Cover tightly and chill in refrigerator 1 hour. Remove from the fridge and whisk mascarpone into yolk mixture until smooth, you may wish to use an electric beater for this if you have one, it will make the job easier and give you a silky texture. In a separate medium bowl, beat cream with vanilla until stiff peaks form. In a small bowl, combine coffee and rum. Take each lady finger and dip it into the coffee mixture. Arrange half of soaked ladyfingers in bottom of a 7×11 inch dish. 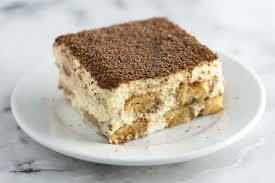 Spread half of mascarpone mixture over ladyfingers, then half of whipped cream over that. Repeat layers and sprinkle with cocoa. Cover and refrigerate 4 to 6 hours, until set, but preferably overnight or even a day or two. 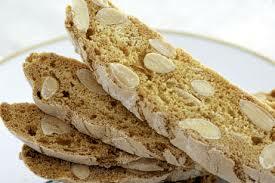 This recipe is for a basic almond cookie, but the flavour options are endless. You can replace the extracts with ones of your choosing, such as anise, orange or lemon. You can add, remove or change the nuts used, or use chocolate chips or poppy seeds instead. Add citrus zest or dried cranberries! You are truly only limited by your imagination. Preheat oven to 325 degrees F. In a large bowl, cream the butter and sugar together, and then add eggs one at a time, beating until fluffy. Stir in the almond and vanilla extracts. Sift together the flour, baking powder, and salt, and then incorporate them into the egg mixture along with the chopped almonds. Stir the dough with a spoon until it begins to come together. I find it easier, once the basic dough has formed, to then dump it out onto a clean floured surface and knead by hand at this point. Divide the dough into 4 parts. Roll each piece into a log about 15 inches long (or as long as your baking sheets are). Place logs onto cookie sheets, two to a sheet, the long way. Flatten the logs out until they are about 3 inches wide with a slight hump going down the middle. Bake for 25 to 30 minutes in the preheated oven, then remove them from the oven. The loaves should be firm to the touch. Transfer the logs to a rack to cool slightly, and then using a serrated blade, cut the loaves into diagonal slices ½ inch wide. Reduce the oven temperature to 300 degrees. Stand the slices upright on the baking sheet and bake for another 40 minutes. Let cool completely before storing in an airtight container. When preparing this dish, make the barley first, as it takes quite a bit of time to cook from it’s raw stage to it’s fully cooked stage that you will need it to be to make the risotto. Once it is cooked, the risotto stage is fairly fast. While you can skip the parsley emulsion, I would not skip the mustard sauce, as it definitely adds the kick that the dish needs. To learn how to clean barley and parsley, click here. Pour 2 tablespoons of oil over a large sheet pan and top with salmon, skin side down. In a small bowl, combine maple sugar and the salt. Rub onto salmon flesh. Cook in preheated 475F oven for 10 minutes. Turn oven on to broil. Cook for an additional 3 minutes. Remove from the oven and let the fish rest. When you are ready to serve, cut it into 6 portions. For the mustard sauce, in a small bowl, whisk together the mustards, vinegar, remaining 3 tablespoons of oil, and a pinch of sea salt. See below on how to plate. In a large pot, bring stock to boil over high heat. Add barley and pinch of salt. Reduce heat to low and cover. Simmer until soft, about 2 hours. Drain. Return barley to pot. In a medium pan, heat the oil and add the mushrooms. Cook, stirring, until soft, about 5 minutes. Add mushrooms and cream to barley mixture. Simmer over low heat, stirring occasionally, about 10 minutes until well-mixed and creamy. Remove from heat. Stir in parmesan and 1 tablespoon of sea salt. In a blender, combine garlic, oil, lemon juice, parsley, and two pinches sea salt. Pulse until smooth. To serve, divide risotto among 6 plates. Drizzle each serving with parsley emulsion. 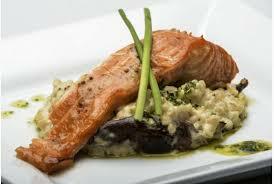 Top each with one portion salmon. Drizzle fish with mustard mixture. Enjoy! For this recipe, it is important that the wet ingredients are mixed really well before adding the dry. Once the dry are in, you don’t want to over beat it, but it needs to be fully incorporated and lump free. Take your time. It’s worth it! For added decadence, you can make the glaze, though note that it is dairy, and therefore would make the whole cake dairy once poured on top. Preheat oven to 350 degrees F. Grease and flour one 9″ x 13″ cake pan. In a large mixing bowl, beat together the oil and eggs with an electric mixer until creamy. Add the sugar and vanilla and beat well. In a separate bowl, combine the flour salt, baking soda, and ground cinnamon. Slowly add this dry mixture to the egg mixture and mix until combined. The batter will be very thick. Fold in the apples by hand using a wooden spoon or spatula. Spread batter into the prepared pan. Bake at 350 degrees F for 45 minutes or until cake tests done. 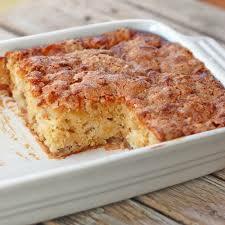 Once cake is cool serve with a dusting of confectioners’ sugar or with the Caramel Glaze below. In a medium sized sauce pan, add the butter, sugar and cream. Bring the ingredients to a boil, and then let bubble for about 3 minutes. Stir gently, but frequently to avoid the mixture from scalding. Remove from heat and add the vanilla. Let the glaze cool just slightly before pouring over the warm cake. 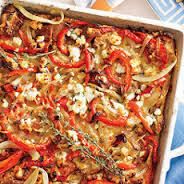 This strata (a fancy term for a layered bread casserole) makes a wonderful brunch dish or great for a milchig dinner. Serve with a nice salad and you’ve got a great meal. You can even prepare this dish the night before and let it sit covered in the fridge then bake off the night you wish to serve it. This tends to make an even better dish because it gives the bread more time to soak up all of the flavours! If you don’t have Shiitake mushrooms, any kind will do. If you don’t have your own roasted red peppers (though you should, see my recipe for them!) you can use jarred. Preheat the oven to 350 degrees. Butter the inside of a 9 x 13 glass baking dish and set aside. Melt butter in a medium sized skillet. Add sliced mushrooms and sauté for 5 minutes or until tender. Season with salt and pepper and set aside to cool. Add sliced red pepper to the mushrooms. Submerge challah cubs in a large bowl of the milk. The bread should absorb all of the milk. In a separate bowl, whisk together cream, eggs, chives, thyme and garlic. Season with salt and pepper, and add the crumbled goat cheese, and whisk together until fully incorporated. In the buttered glass dish, lay half of the bread mixture down and don’t worry if it does not fill the entire base. Top with a layer of mushroom/pepper mixture. Add grated fontina and parmesan, then the cream/egg mixture. Repeat the layering process using the remaining ingredients. Bake strata uncovered for 1 hour or until golden brown and firm in the middle.